We have happy hour every friday, open from 3-9; live music is 5:30 to 8:30, with snacks and $5 glass pours. Washington is famous for many things. Seattle, lumber, Mount St. Helens Volcano, the Cascade Mountains, to name a few. But, did you know the actual number of vineyards and wine Washington is producing? Washington is second only to California in the United States in the production of wine. In 2006, the state had 600 wineries and over 31,000 acres of vineyards planted. At the time it exported to over 40 countries around the world. The Mediterranean climate in Washington is ideal for producing outstanding grape clusters. The long hours of daily sunlight result in food-friendly wines with low alcohol content. On average, Washington has two more hours a day of sunlight than in California. It’s a must visit for any wine enthusiast wanting to expand their palette and new world wine knowledge. Let us introduce you to a winery whose wines are the best example of the Washington terroir. Northwest Cellars, located outside of Seattle, is near parks, marinas, and tourist attractions. This winery sources their grapes from only the best vineyards in Washington. This means they do not grow them on an estate property that they own. They buy a certain amount of tonnage from farmers every year. These vineyards Northwest is pulling from are located in some of Washington’s most famous AVA’s. Also known as American Viticultural Area. We are talking grapes hailing from Columbia Valley, near the Columbia River Plateau. The grapes are sunning themselves in a warm Mediterranean climate and Red Mountain. This is a newer AVA, as of 2001. It has rich soil and a continental climate. This helps to produce those tasty Bordeaux varietals. 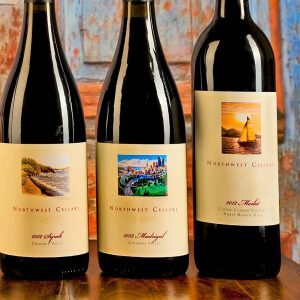 There is no doubt about it, Northwest Cellars is a red wine lovers dream. With over 10 varietals to choose from, even red blends, your sipper is going to be extra busy. Spend the afternoon in their tasting room chatting with the knowledgeable staff. You will enjoy each of these fruit-forward wines. The wine list consists of only handcrafted wines that are all award-winning. Drink them now, in 5 years, or in 20 if you prefer. They will hold up in your cellar over time. Fun Fact: For a little something extra this winery offers custom labeling. Order private labels for weddings, corporate events, or even personalized gifts. Order something special for your personal collection to show off to your friends. The options are limitless. Even if you are already a fan of Washington wines and varietals, there is a bottle here for you to discover and love. Priority Wine Pass believes there is a wine here for a connoisseur or the newest wine dabbler. They have 17 different wines, ranging from $16 to $56/bottle.